Poster produced by the Hamas administration’s Religious Endowment Ministry to encourage the Islamic code of conduct campaign on the streets and beaches of the Gaza Strip. The campaign is titled "Yes to modest behavior”. The poster shows a modestly dressed woman wearing a veil ( hijab ) surrounded by menacing images of demons (Masajidna, the Hamas Religious Endowment Ministry website, June 19, 2009). Veiled female police officers in the Gaza women’s police forcing local women to wear veils and to dress modestly in public. 1. Ever since it took over the Gaza Strip in June 2007, Hamas has been promoting a process of gradual Islamization, designed to further its vision of establishing a Palestinian state based on Islamic religious law ( shari’ah ). While that process is related to similar trends taking place in the Arab and Muslim world, the Gaza Strip has several unique social and political characteristics making it a fertile ground for Hamas to promote its political and religious views. This study explores the main expressions of the Islamization process in the Gaza Strip, focusing on the period since Hamas’s takeover, and attempts to assess its implications in several aspects: the internal Palestinian political aspect, the Israeli-Palestinian conflict, and the regional and international aspect. 3. After the Hamas takeover of the Gaza Strip in June 2007, it was given an opportunity to put its radical Islamic vision and ideology into practice, establishing an Islamic Hamas-ruled political entity in the Gaza Strip. At the same time, however, Hamas is forced to maneuver between its vision and its governmental needs, which forces it to display pragmatism in its routine conduct. As a result of that, in the two years that have passed since the takeover Hamas has been implementing a process of Islamization in the Gaza Strip; it does so gradually, however, to keep from alienating the Gaza Strip population and not to draw criticism from its internal and external opponents. 4. More than just the fundamental goal of implementing radical Islamic ideology, the Islamization of the Gaza Strip, as far as Hamas is concerned, also has clearly political goals. Specifically, Hamas views that process as a means to tighten its control over the Gaza Strip and promote its interests as a de facto government. Through the Islamization process, Hamas attempts to subdue local sources of opposition to its power, mostly from Fatah, the traditional clan-based power sources, and even radical Islamic opposition which identifies with the ideas spread by Al-Qaeda and poses an ideological challenge to Hamas on the activist radical Islamic scene. As a de facto government, Hamas is obliged to take into consideration the existence of internal sources of opposition to the measures designed to publicly enforce the Islamic code of conduct. In addition to the internal Palestinian criticism from Fatah and the Palestinian Authority, Hamas must also consider the outside criticism drawn by the Islamization process, mostly from Egypt (which is well aware of the negative repercussions of having a radical "Islamic emirate” established along its border). 5. As a result of the need to maneuver between the aforementioned constraints and considerations, Hamas’s policy over the last two years has been characterized by enforcing a gradual process of Islamization on the Gaza Strip population. While the process is measured and calculated, it is carried out persistently, systematically, with tremendous determination (accompanied by a great deal of self confidence), and invasively (pertaining to all areas of life). Above all that, the final goal envisioned by Hamas is the establishment of an Islamic entity in Gaza , not immediately but rather in a gradual process, turning the Gaza Strip into a stronghold of radical Islam as viewed by Hamas (and not by Al-Qaeda). It should be noted that the Islamization process of the Gaza Strip is taking root in a fertile ground, both socially (the extreme poverty and unemployment, the crowded conditions and frustration suffered by the Gaza Strip residents, some two thirds of them defined by UNRWA as refugees) and politically (Hamas’s tight grip on the Gaza Strip and its weakening of secular natured sources of opposition, mainly Fatah). 6. The Hamas takeover of the Gaza Strip in June 2007 did not mark the start of the Islamization process there—it had been gradually taking place in previous decades. The process gained momentum during the first intifada (the Palestinian terror campaign 1987-1993) and was accelerated during the second intifada, since late 2000. In those years, the process was reflected in the extensive construction of mosques (most of them under the political control of Hamas); the embracement of Islamic dress and appearance codes (various types of veils for women and beards for men); the formation of a widespread infrastructure of radical Islamic organizations involved in social assistance and education, making good use of the governmental vacuum in the Gaza Strip; the education of children and teenagers in the spirit of radical Islam, both in Palestinian Authority educational institutions (now under the control of Hamas) and in non-formal educational institutions (such as summer camps, culture institutions, sports clubs). 7. As part of a deliberate policy espoused by Hamas, the Islamization process continued and was even accelerated in the two years that have passed since the Hamas takeover of the Gaza Strip. Enforced by the Hamas de facto administration, the process encompasses all the areas of life of Gaza Strip citizens: law and legislation (passing radical Islamic laws and regulations); the establishment of economic institutions of Islamic character (a bank, an insurance company); the enforcement of an Islamic code of conduct on the daily lives of the population by the Hamas internal security apparatuses (wearing veils, banning mixed gender social gatherings, gender segregation on beaches, banning alcohol, and so forth); the significant increase in the number of mosques (most of them controlled by Hamas) in the Gaza Strip; the deepening of formal and informal Islamic education (in educational institutions, from kindergartens to universities, in summer camps); the accentuation of the Islamic character of the media (mainly Al-Aqsa TV). Operatives in Hamas’s military-terrorist infrastructure, as well as operatives belonging to other terrorist organizations and networks, are indoctrinated with radical Islam, increasing their motivation to perpetrate terrorist attacks against Israel . a. Deepening the split between the Gaza Strip and Judea and Samaria : the immediate results of the Islamization process can already be seen and felt in the daily lives of the population. However, its deeper impacts on society will be seen over the long term in future generations, as a result of the radical Islamic indoctrination undergone by youngsters living in the Gaza Strip. The process helps deepen the political, social, and even economic split between the radical Islamic entity in the Gaza Strip and the Palestinian Authority-administered territories in Judea and Samaria . 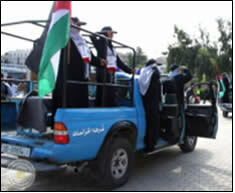 The Islamization process leads to the emergence of a new social reality in the Gaza Strip, posing substantial difficulties to any possible future attempt by the Palestinian Authority to regain political and security control of the Gaza Strip, even if the national dialogue between Fatah and Hamas does eventually result in some kind of arrangement. In the future, Hamas may attempt to duplicate the process in Judea and Samaria , even though, for now, the Palestinian Authority’s intensive counter-activities have been successful in containing the threat posed to its rule by Hamas and the radical Islamic ideology it represents. b. Threats on the Middle Eastern scene (mostly against Egypt) and on the international scene: the establishment of the Hamas-ruled radical Islamic political entity in the Gaza Strip is a phenomenon which poses a potential threat to pro-Western pragmatic Arab countries, mainly Egypt. As it develops, the Islamic entity in the Gaza Strip may become a role model for terrorist organizations and Islamic organizations not only in the Middle East but also elsewhere. The Hamas-controlled entity in the Gaza Strip may engage in acts of subversion by joining forces with radical Islamic elements which oppose the Egyptian government, mainly the Muslim Brotherhood, the movement out of which Hamas branched off. Evidence of that was seen in the exposure of a Hezbollah network in Egypt , which was involved with Hamas in the Gaza Strip and possibly also with radical Islamic elements belonging to Egypt ‘s Muslim Brotherhood. At the same time, the Hamas-controlled entity in the Gaza Strip is a fertile ground for Iranian influence, given their joint interests, mainly the violent struggle against Israel . This is reflected in the arms, ammunition, and funds provided by Iran to Hamas, 2 even though Hamas (being of Sunni radical Islamic character) is not willing to fully submit to the dictates of the Shi’ite Islamic regime in Tehran (unlike Hezbollah). 2 For details see our January 12, 2009 Information Bulletin: "Iranian Support of Hamas”.